Home Health Too Much Salt Can Kill You: How to Decrease Your Use and Protect YourHeart!! Too Much Salt Can Kill You: How to Decrease Your Use and Protect YourHeart!! We all have heard about sodium. Sodium and chloride are the primary components of salt. Often when I talk to my patients about lifestyle changes that they can make to improve their heart health; the first thing I am told is they have stopped adding salt to their meals. 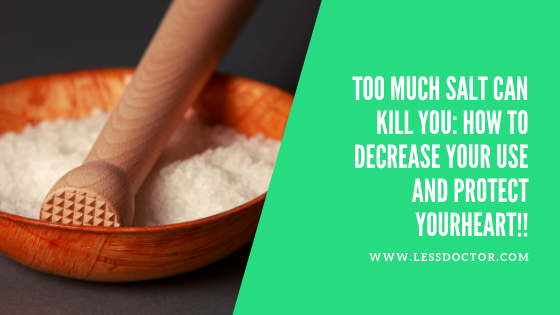 In this sense, most of us have in our minds that too much salt is a bad thing for our health. In Western cultures, salt is in almost all of our food sources. We use it for taste, as a preservative, and also for texture. When people get serious about lowering their salt, they are often amazed at how much they consume. Look on nutrition labels for all your food sources. Salt will be listed by serving. Make sure you also look at the label if you drink soda, including diet drinks, as well as coffee and tea. We all need salt in our diets. Salt helps us maintain our blood pressure, keep our cells healthy, and allows our body to conduct electrical signals in our heart, gastrointestinal tract, and nervous system. Unfortunately, we often get too much. The Dietary Guidelines for Americans recommend limiting sodium to less than 2,300 mg a day. If you are older than 51, black, or have high blood pressure, diabetes, or kidney disease your diet should have less than 1,500 mg. This is the elevated blood pressure response with salt intake. It is quite variable in each of us. The variations are driven by our genetics and age. Unfortunately, salt sensitivity increases with age and this is what drives the recommendation to lower your daily salt after the age of 50. Also, people who are obese, black, have metabolic syndrome, or chronic kidney disease have higher rates of salt sensitivity, the DASH-sodium clinical trial showed. High blood pressure (primary hypertension) is often of reflection of where we live. It is seen frequently in societies that on average consume 2.3 grams of sodium a day or more. But it is almost never seen in societies that consume less than 1.2 grams of sodium a day, studies show. In addition, when people who live in low sodium societies migrate to high sodium societies, they often develop high blood pressure. These observations provide powerful insight into the role of lifestyle and dietary choices on our health. By lowering your sodium by 1.0 gram per day for 4 weeks a study of patients with high blood pressure showed that you could typically lower your blood pressure by 5/3 mmHg. In addition, many of the commonly used blood pressure medications are more potent or effective when used in combination with salt restriction. Why is it important to worry about blood pressure, even early in life, and even you are a very active athlete? High blood pressure is a very common cause of atrial fibrillation, heart failure, coronary artery disease, stroke, dementia, and kidney disease. If you consider all of these disease states, it accounts for most of the common reasons we die. What Are the Consequences of Salt Consumption? The most sobering details of the study from Tufts University were the global consequences of too much salt consumption. The group estimated that 1.65 million deaths from heart causes were attributed to high sodium intake. These deaths account for approximately 1 of every 10 deaths related to the heart. Of these deaths, 4 of 5 were in lower-income countries and 40 percent were before the age of 70. In general, the highest death rates were seen in Central Asia, Eastern and Central Europe followed by East Asia and Southeast Asia. The country with the highest death rates attributed to sodium was Georgia. The Mayo Clinic has an excellent resource to follow to lower your salt intake. 1. Eat more fresh foods (remember salt is preservative and frequently is added to processed food products). 2. Choose “low” sodium products. 3. Remove salt from recipes when possible and always from your table when you eat. 4. Minimize the use of condiments that are often sodium-rich (soy sauce, salad dressing, ketchup, mustard, relish, and sauces/dips). 5. Replace salt with herbs and other spices to improve salt (do not substitute with sea salt as this contains the same amount of sodium as typical salt). 7. Don’t forget your bread. Bread often contains a lot of sodium. I often see people buy whole grain or multigrain bread as a healthy food choice. Again, be careful to read the back label to see how much sodium per slice is in the bread. It can be up to 100 mg/slice.